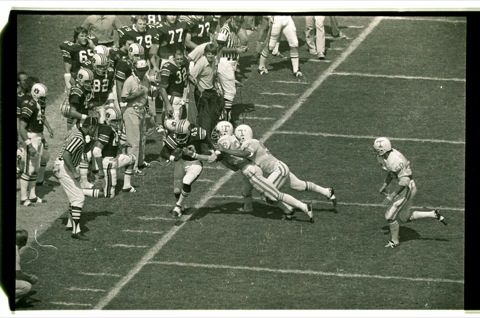 It takes two Vols to handle Gossom in the 1974 Tennessee game, the first ever played in Jordan-Hare. The airplane took off with my rookie stomach all a flutter, my hands digging deeper into the hand rest. It was my first plane trip as a member of the 1971 Auburn Tigers football team. The team’s veterans were calm, both about the flight and the upcoming game. They had been to Knoxville before and knew what it would take, to be successful. That night at our hotel, Tennessee students on a mission of distraction knocked on our doors, and honked their horns all night, in an attempt to keep us up. The game meant that much. We beat them 10-9. We got out of the stadium by the skin of our teeth as beer cans, the old hard ones, whiskey bottles and bad names rained down on us, the happy victors. The next year, 1972, in Birmingham’s Legion Field, Tennessee would be the biggest game of a young season. They were undefeated and ranked number four in the nation. We were unranked. With six sophomore first time starters in our offensive lineup, we locked them into a smash mouth, manhandling affair and again took them, 10-6. The Birmingham News described our mood as, “The Tigers were spoiling for a fight.” We were. We ran the same running play, 21 Power, between the center and the right guard, 12 times in a row until we scored. We pounded our chests. We were the kings of Legion Field. Play after play, we lined up and smacked them in the mouth. We only threw four passes all day, completing one. We finally let our foot up off their throats enough for them to score with a minute and a half left in the game; too little, too late. The next year, 1973, back in Knoxville, a beautiful day turned ugly fast. Storm clouds covered the sunshine. Two fumbles by us, and one drive by them and bam, we were down 21-0. The wind blew; the rain fell in driving piercing sheets. It stung like little arrows piercing your skin. From the wide receiver position I could not see our offensive linemen. Both teams sloshed around in puddles of water. Tennessee’s young coach Bill Battle sat on his lead. Rather than risk a fumble, he had his team punt to us on first down. We’d run three plays, punt to them and they would punt it back. Embarrassing. They beat us 21-0. Their fans derided us as we ran off the field. That scene stayed with us for an entire year. The next year – September 1974 – 64, 293 fans poured into Jordan-Hare Stadium. It was as hot a day as I can remember in Auburn and for the first time ever Tennessee had come to town. We were waiting for them. There was ample motivation. The season would be Coach Shug Jordan’s last winning one. We wanted revenge for the year before. There was still more drama. Until that September, Auburn had always played its home game in the then annual series in Legion Field. By getting Tennessee to agree to a true home and home series, Auburn’s sports, business, and social evolution scored big time. The week before the historical game and after a cheap victory over Chattanooga, President Philpott warned Coach Jordan, “The season starts next week.” We all understood. The game was more than a game. This one was for the history books. It was the same 21-0 they’d taken us by the year before. “Damn, how do you guys stand this heat,” the Tennessee defensive back asked me early in the first quarter. I knew then we had them. The game never in doubt, we begged Coach Jordan to punt as least once on first down. “Punt, Shug, Punt!” He would not do it. Coach had class. Thousands of little kids stormed the field after the game to get their souvenirs. My sweatbands, and chinstrap long gone, I made my way amongst all the Auburn fans on the field, to the locker room. President Philpott proudly awaited us. We’d done more than win a game. We’d advanced Auburn football down the road just a little bit. Those of us in that locker room will carry it with us the rest of our lives. Thom Gossom, Jr. is an actor, author and former #49. His memoir “Walk On: My Reluctant Journey to Integration at Auburn University” can be ordered at www.walkongossom.com and Amazon.com. You can see Thom’s thoughts on the Gus Malzahn offense here. Great interview. One of my favorite childhood memories was getting to go on the field and getting sweatbands and other stuff from the players. Mostly I ended up with tape probably. After basketball games I loved getting the stat sheets from press row. But mostly I just loved being a kid and getting to play on the real field or court after the games. Seemed perfectly natural then, and now five cops would grab you. I was there. UT made the grave mistake of staying IN AUBURN at the Heart of Auburn motel. We raised HELL outside that motel until dawn. Some of us were drunk? Ken Burks (Ensley HS) scored all three touchdowns as Auburn crushed the orange (naranja). We refrained from smoking pot because AUPD kept rolling by to check us out. I think it was OK to them as long as we only consumed booze ( no dope). Fun times. I played on that team. Can’t believe Gossom didn’t mention Kenny Burks. Kenny, the offensive line and our defense were the heroes. No need to cover our receivers in that game.